Market & Political Turmoil Inflame Ugliness; Bombshell Guest: Stephen Leeb Would Not Be Surprised By 3-Digit Silver and 5 Digit Gold?! Bombshell Guest: Stephen Leeb Predicts 3-Digit Silver and 5 Digit Gold?! 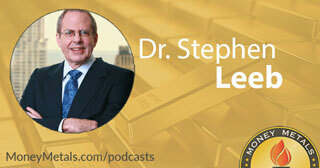 Coming up we’ll hear a wonderful interview with first time guest Dr. Stephen Leeb of Leeb Capital Management. Dr. Leeb weighs in on what he believes will be a major fly in the ointment for the U.S. when it comes to the trade war with China and also tells us if he’s still holding onto the thought that we’ll see triple digit silver prices sometime during the next decade. Don’t miss our conversation with the great Stephen Leeb, coming up after this week’s market update. As Hurricane Michael ravaged Florida, the stock market got ravaged by some of the heaviest selling it’s seen in years. The Dow Jones Industrial Average careened 831 points on Wednesday and plunged another 545 points Thursday. The markets are rebounding somewhat early here on Friday however, although there was still plenty of damage done for the week. For the first time in months, stock market investors began seeking refuge in precious metals. The paper gold market saw significant buying volumes Thursday, with spot prices breaking out to a two-month high. Gold’s advance of Thursday of nearly $30 was its best one day performance in two and half years, since Brexit. The yellow metal currently checks in at $1,219 an ounce after gaining 1.2% this week. Turning to the white metals, silver is playing second fiddle to gold, down 0.5% on the week to trade at $14.61. Platinum is higher by 1.6% since last Friday’s close to come in at $840. Finally, palladium is unchanged for the week – now valued at $1,077 per ounce. The GDX gold miners index is confirming precious metals strength in a big way. GDX surged 6.5% on Thursday to break out to a two-month high. Mining is actually the ONLY sector in the stock market performing well this week. Everything else – industrials, technology, energy, consumer staples, you name it – is selling off. Donald Trump: No, I think the Fed is making a mistake, they're so tight. I think the Fed has gone crazy. CNBC Talking Head 1: Well if the Fed has gone crazy, he should replace Jerome Powell then. I mean, if you have a crazy Fed chair… no, I didn't call them crazy, but he just said it twice. CNBC Talking Head 2: I think you have to think about that. CNBC Anchor: No. Seriously, after he said, oh, Jerome Powell is a great man, blah, blah, blah. CNBC Talking Head 2: That's exactly what he says about everybody before he fires them. If the President attempted to fire Fed chairman Jerome Powell, it would set off a political firestorm. Democrats and Fed backers would undoubtedly accuse him of trying to destroy the central bank’s so-called “independence.” Of course, that’s a total farce anyway. The Fed is packed with politicians and market manipulators, and it’s heavily influenced by both Wall Street and Washington. On Thursday, President Trump said he wouldn’t fire Powell even as he continued to blast the Fed, blaming it specifically for triggering the stock market correction. Donald Trump: It's a correction that I think is caused by the Federal Reserve with interest rates. The dollar has become very strong which, frankly, people can debate whether or not they like a strong dollar or not. And we have interest rates going up at a clip that's much faster than, certainly, a lot of people, including myself, would have anticipated. I think the Fed is out of control. I think what they're doing is wrong. A Fed-instigated stock market crash ahead of the mid-term elections would be awfully convenient for Democrats. Polls show several Senate seats currently held by Democrats now in the “toss up” category. After the Brett Kavanaugh confirmation hearings descended into a hyper-partisan smear campaign, Democrat incumbents in states Trump won – including Missouri, Montana, Indiana, Florida, North Dakota, and West Virginia – face potential backlash from voters. Joe Manchin of West Virginia tried to save his Senate seat by voting for confirmation – but only after wavering Republican Susan Collins had already put Kavanaugh over the top with her “yes” vote. Over the past couple years, every major confirmation battle and every piece of legislation pertaining to tax cuts and Obamacare repeal has hinged on whether Republicans could get Susan Collins, Lisa Murkowski, and John McCain on board. John McCain is no longer with us. But if Republicans fail to pick up additional Senate seats, their legislative agenda will remain on very thin ice. Even if they do end up gaining a couple seats in the Upper Chamber, they are almost certain to lose seats in the House – and could lose their majority altogether if it’s a bad night for Republicans. Democrats are certainly energized enough to make it a bad night for Republicans. But they may be too energized for their own electoral good. Militancy and open calls for incivility now emanate from Democrat party activists and figureheads. Even the Clintons, who usually wear a mask of moderation, have now let that mask slip. Hillary Clinton told CNN this week that “you cannot be civil” with Republicans, and that “civility can start again” only when Democrats win back Congress. Next month’s election thus poses two distinct threats to investors. If Democrats win, that would stop any Audit the Fed and sound money legislation dead in its tracks. It would doom any further tax cuts and likely cause the stock market to sell off. If Democrats lose, incivility and social unrest could spread and make doing normal business in America more difficult. Regardless of which way the political winds blow heading into November, investors would be wise to brace for more market action like we saw this week – stocks selling off and precious metals rising as a safe haven.